PRINCETON, N.J. – The ECHL announced on Thursday that linesman Charlie O’Connor has been named the recipient of the 2017-18 Ryan Birmingham Memorial Award. The award honors an On-Ice Official for his contributions and dedication to the league officiating staff and is determined in voting of ECHL On-Ice Officials. It is named in honor of ECHL linesman Ryan Birmingham who tragically lost his life in an automobile accident in May 2007. “It’s an incredible honor to receive the 2017-18 Ryan Birmingham Memorial Award,” O’Connor said. “I would first like to thank all my fellow officials for selecting me to receive this distinguished award. There are so many outstanding linesmen and referees in the ECHL, and to be selected for the award is very special to me. The 2017-18 season was O’Connor’s fourth season in the ECHL. He has been selected to work the Kelly Cup Finals in each of the last three seasons and served as a linesman for the 2017 CCM/ECHL All-Star Classic in Glens Falls, New York. He also has experience as a linesman in the United States Hockey League and the American Hockey League, as well as working international competitions for the IIHF. The 28-year-old previously served as a linesman for the 2013 and 2014 USHL Clark Cup Finals as well as at the 2014 USHL/NHL Prospects Game. “I would like to congratulate Charlie O'Connor on receiving the Birmingham Award,” said ECHL Manager of Officiating Mike Pearce. “Charlie is emblematic of everything the Birmingham Award represents. It is a tremendous honor to be recognized by your peers in the way Charlie was in this year’s voting. “Charlie represents the ECHL and all of its officials in the best possible way,” Pearce continued. 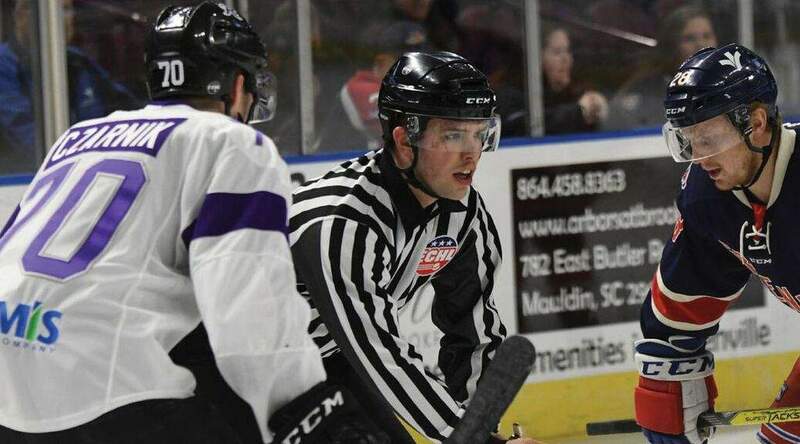 “This is a great honor for Charlie and we are very proud of him as an official, and more importantly, as a member of the ECHL Officiating staff. Charlie is selfless with his time and experience in assisting all officials with any issues that arise both on and off the ice. Charlie has worked three consecutive Kelly Cup Finals and has had a positive impact on every official on staff. The ECHL will present the award to O’Connor during the 2018-19 season. The 2007-08 edition of the ECHL Rule Book was dedicated to the memory of Birmingham, who was featured on the back cover, and ECHL on-ice officials wore a commemorative patch on their left shoulder that has 60, which is the number that Birmingham wore, and the initials RJB. Birmingham began his officiating career when he was 12 years old in the Southgate Minor Hockey Association and worked his way into the USA Hockey Junior Officiating Development Program in 2003. Birmingham was hired as a full-time linesman by the ECHL in 2006 and worked 83 games in the regular season and four games in the Kelly Cup Playoffs, including his final game, Florida at Charlotte, on April 17, 2007. There were 31 former ECHL officials who worked as part of the NHL officiating team in 2017-18 with referees Jake Brenk, Francis Charron, Tom Chmielewski, Ghislain Hebert, Jean Hebert, Marc Joannette, Trent Knorr, Pierre Lambert, T.J. Luxmore, Peter MacDougall, Wes McCauley, Jon McIsaac, Dean Morton, Dan O’Rourke, Brian Pochmara, Kevin Pollock, Kyle Rehman, Chris Rooney, Graham Skilliter, Justin St. Pierre and Ian Walsh, and linesmen Steve Barton, Ryan Daisy, Brandon Gawryletz, Matt MacPherson, Brian Mach, Bevin Mills, Kory Nagy, Tim Nowak, Bryan Pancich and Jay Sharrers. Forty-one of the 63 referees working in the American Hockey League in 2017-18, including three of the eight referees contracted to the NHL, came from the ECHL. Ninety-six of the 179 linesmen in the AHL have worked games in the ECHL.